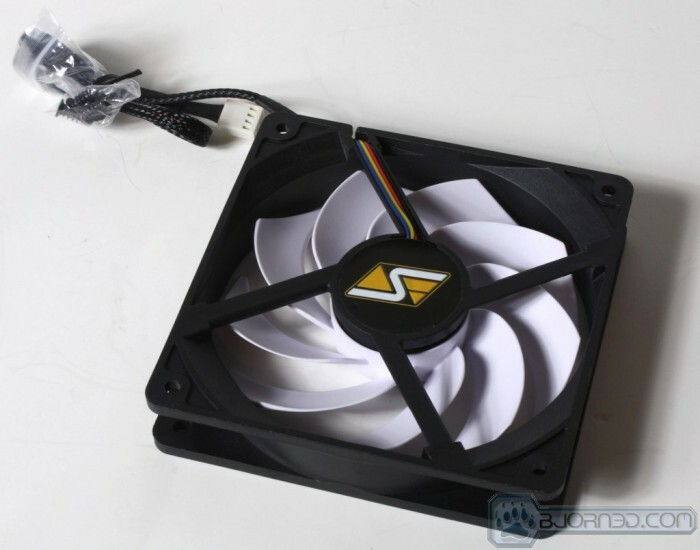 Swiftech has been in the enthusiast PC cooling market for over a decade now. 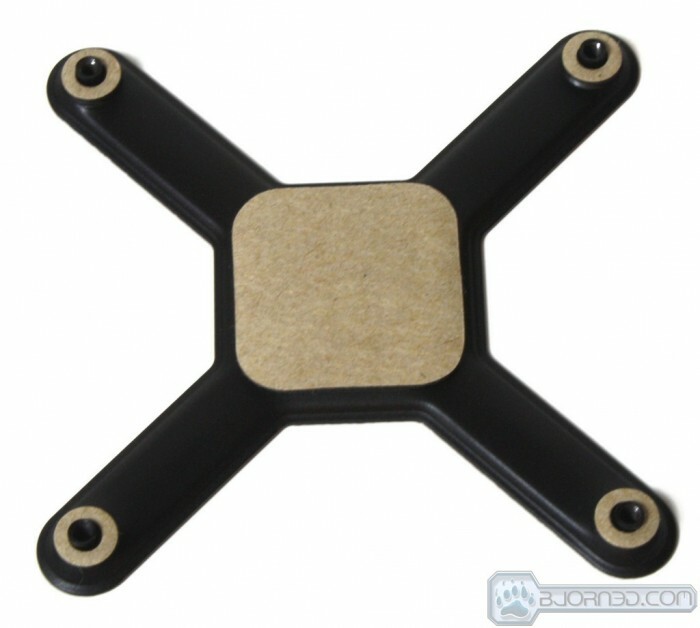 Back in early 2000 they made their way into the enthusiast PC cooling market with the MC370 line of heatsinks, and have been an industry leader ever since. Swiftech has made many innovations in the world of PC watercooling which allows for better performance and easier installation. 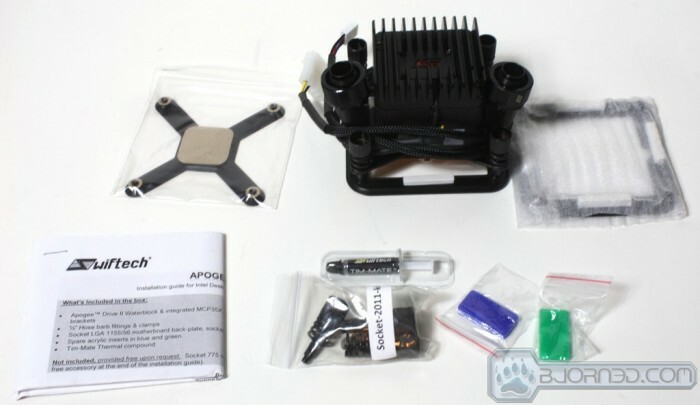 Today we are looking at the newest addition to their product line: the Swiftech H20-320 Elite kit. Some may remember back when we reviewed the H20-220 Edge kit; and then after that the H20-320 Edge HD Kit. Both of these kits impressed us greatly so we were very excited to hear that there was a new revision ready for testing. Here we can see the configuration as displayed on the Swiftech page although some items are not shown to give a more clear and concise representation of your kit. The Elite kit includes many new features such as the new Helix 120mm PWM fans, Rev 2 QP-RES radiator and the stand out in the crowd would be the Apogee Drive II block/pump combo. 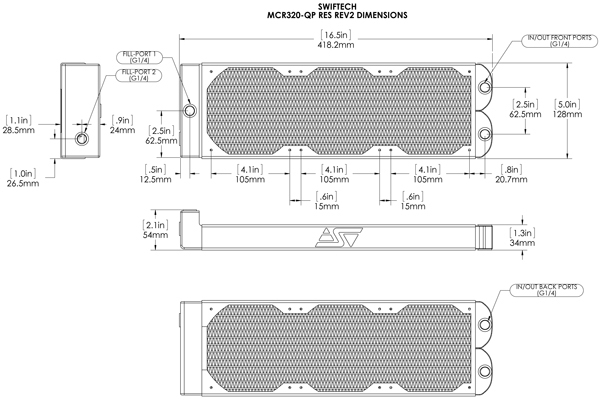 The following pages we will look into the components and performance of the Swiftech H20-320 Elite water cooling kit and does it justify the $279.95 MSRP. 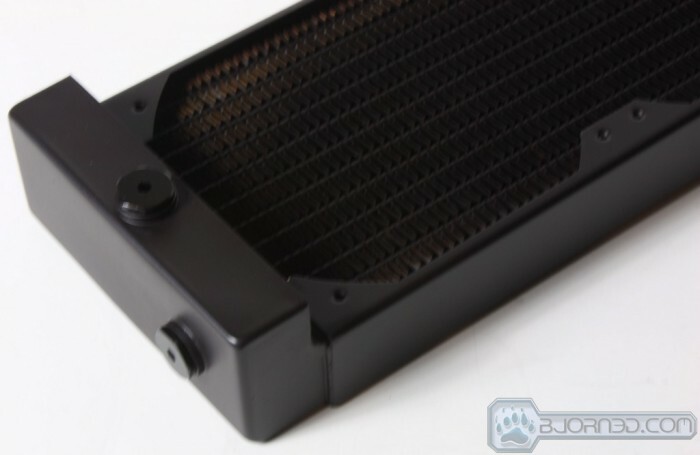 The pump is PWM controlled and directly mounted to the CPU cooling block which hels get direct flow to the CPU but will also help with radiator fitment and compatibility. This is a big plus in my book as this means Swiftech has been listening and using feedback from end users to further improve their product offerings. This is great as many may well know that this is something sorely missing in modern PC enthusiasts offerings. 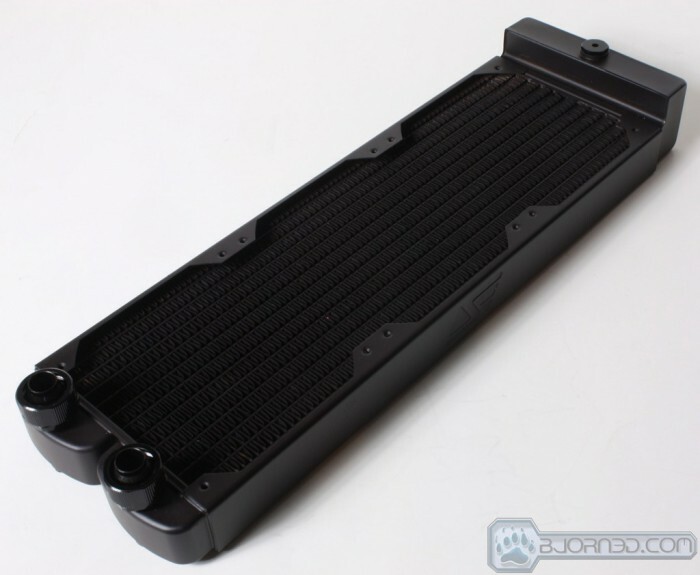 The radiator is very similar to the one we saw in the ‘HD kit with the L shape reservoir in place making it unnecessary to use a bay or cylinder reservoir as the radiator has a extra tank capacity for the liquid cooling system to help keep the system and lines free of air. The end tank for connectivity has the standard in/out ports but it has them on both sides to ensure top or bottom mounting or however it is configured a fitting can be placed for efficient routing. This is very similar to the mounting we have seen on the MCR Stacker series radiators which have fittings on both sides which allows stacking the radiators for a massive cooling setup. The fins are not super tight which means they can be used with lower speed fans with less noise and still cool efficiently. This is great for those looking for a nice cooler without the excess noise from other radiator models with very tight fin density causing the need for higher pressure/speed fans which in turn make more noise. The block is not really just a block anymore. It is not a lighted pump assembly with the block buried deep below. But seeing the internals we feel safe with the assumption that performance should be excellent as it utilizes the same super thin pin matrix design which gave such great performance we have seen before. Also on top is a POM housing holding the pump impeller to which feeds the coolant to the baseplate and keeps everything running nice and cool. At the top of this assembly is a cooling heatsink directly mounted to teh pump to help dissipate heat as the pump under extended usage in this position im sure can get a bit warm. This just goes to show that many things have been considered and real world solutions put into place to ensure a great user experience for anyone looking to pick up this kit. 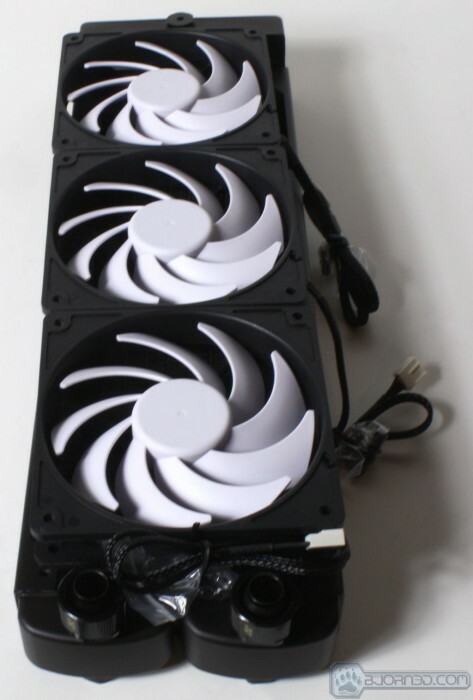 The fans are totally new from Swiftech. 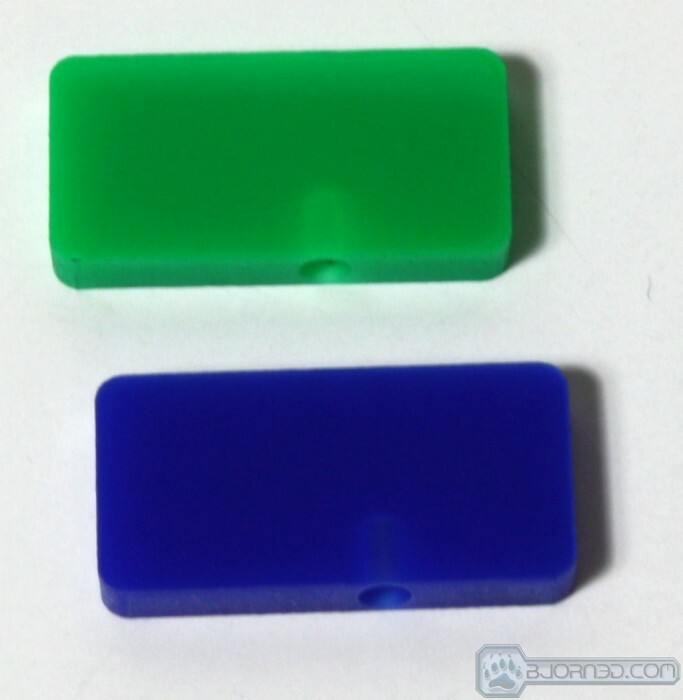 The H20-X20 kits used to come with a standard fare design. 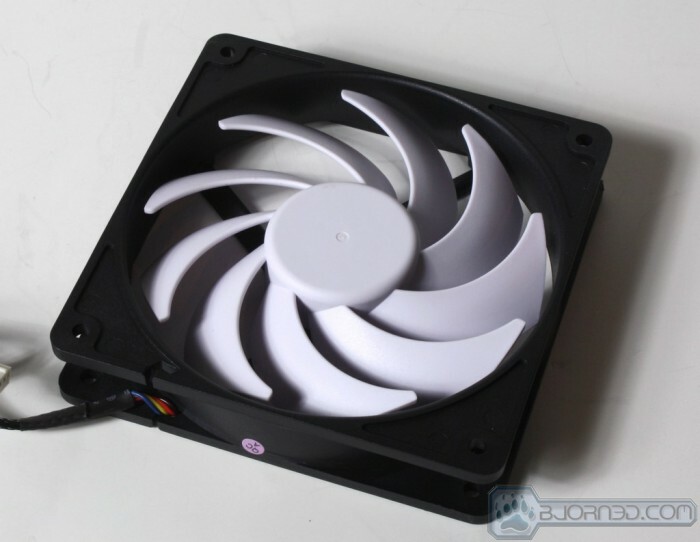 These fans are more of a deep curve twisted blade design that tens to push decent airflow with quite little noise. These specific ones included in the kit are PWM models which means that they are adjustable automatically and easily from a set reference to ensure quiet when you want it and cooling power when you need it. Swiftech includes their new Lok-Seal model compression fittings in the elite kits to ensure not only virtually leak-proof installations but also a fit and finish that is really tough to beat. The previous kits offered standard barb fittings which are very nice by their own right but the look of the compression fittings installed just have a very neat and clean look when installation is done. 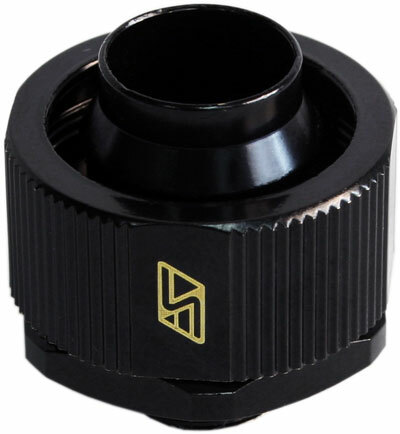 One thing worth noting is that unlike many fittings we have seen which use a knurled finish, the Lok-Seal fittings have flat edges so that a wrench can be used to properly tighten them. We would avoid using something like pipe wrenches or pliers as they can mar the finish and just make them look bad. 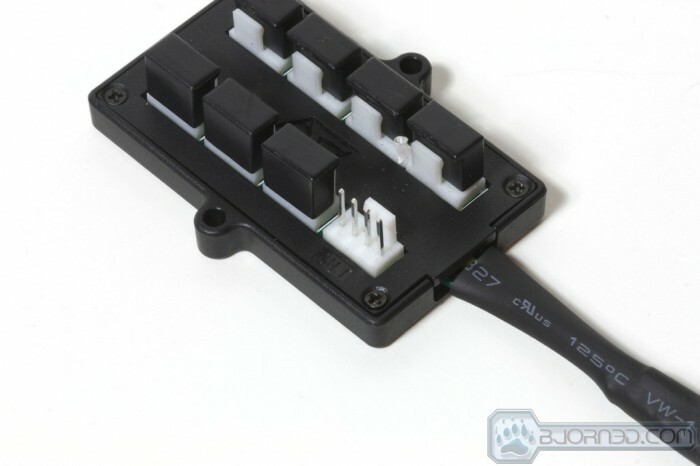 Swiftech has really innovated something here in their 8 way PWM splitter which is simply a 8 fan header block taht can be mounted anywhere. It feeds PWM/RPM feedback from the position 1 to the motherboard PWM control and all of the connected fans or pumps with PWM control can all be throttled via a single PWM value which in teh case of a Liquid cooling installation where fans can be numbering well over 3 or 4 trying to get all of these fans to sync if PWM controlled can be a real headache. 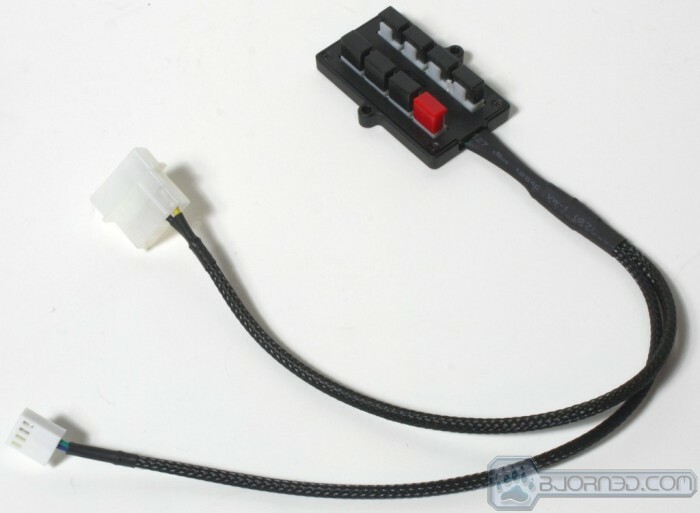 This device also pulls its power from a standard 4 pin PATA connector so lack of power should never be a real issue. 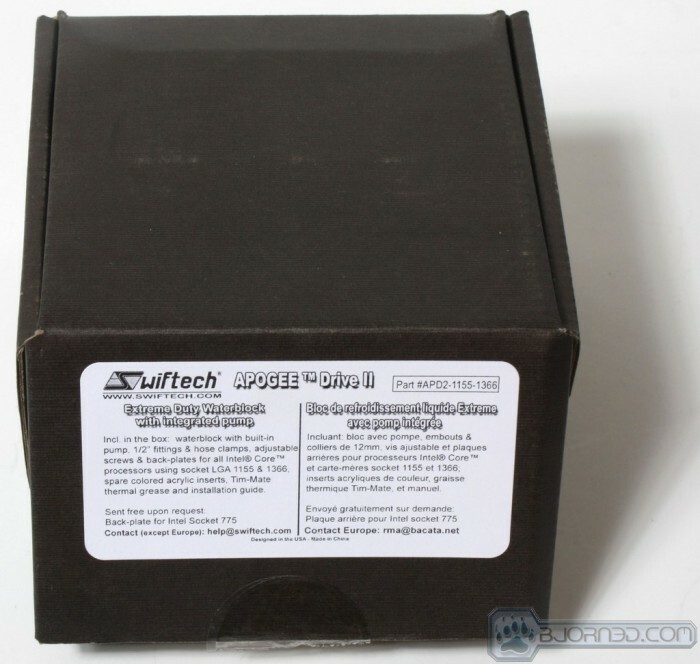 The Packaging is rather standard fare and rather than going with the dragster imaged box sleeve as we have seen previously this time Swiftech opted for just a standard brown box which is fine with me. 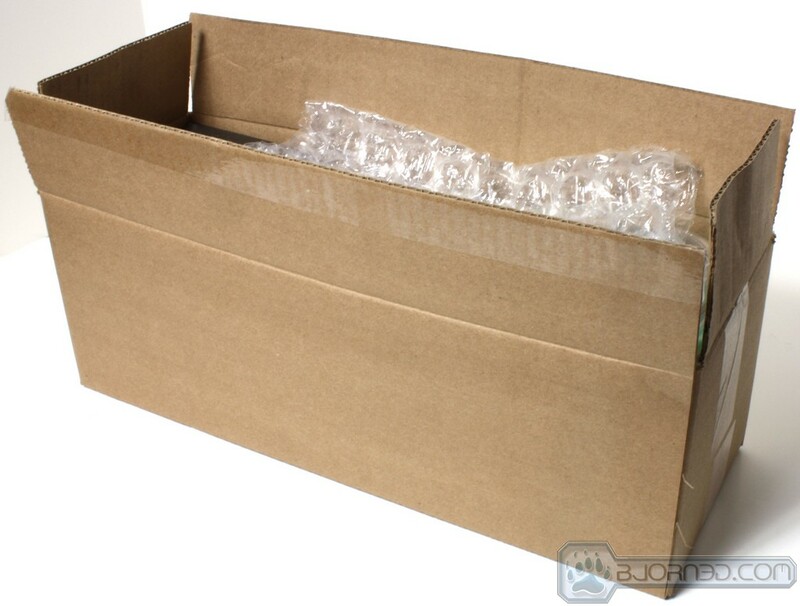 Anyone getting a kit like this knows what they are getting and what they want to do with it. Once opened there is a lot going on here. Here is all that comes in the box. 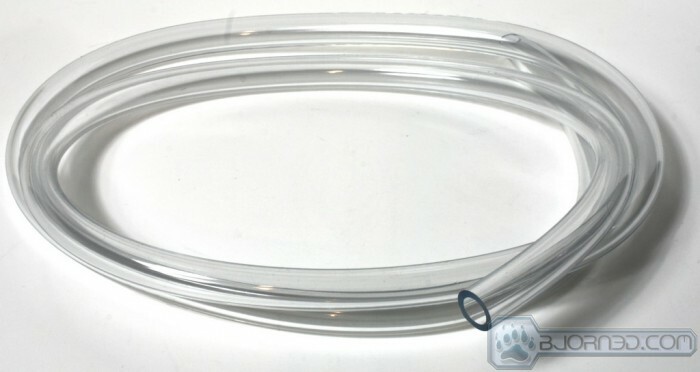 With 6 feet of tubing included it is instantly clear that this kit is made to expand to whatever liquid cooled components we want to add, and also even other radiators if so desired. 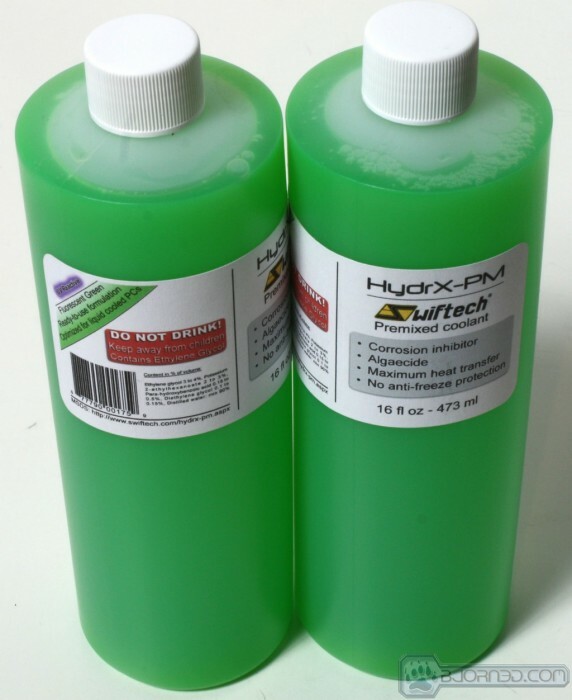 Lastly, one thing we really like is the premixed coolant offered now, as opposed to the first H20-220 kit, which contained a small bottle of coolant concentrate which had to be mixed with liquid. 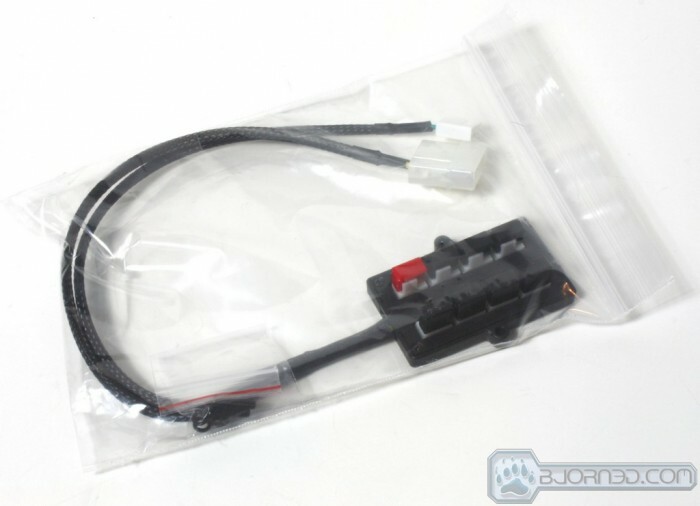 This inevitably would leave us questioning and hoping the water used was of upmost purity to avoid any sort of issues down the road, but with the premix now being included any worries are gone as there is Swiftech quality control over every aspect including the coolant. 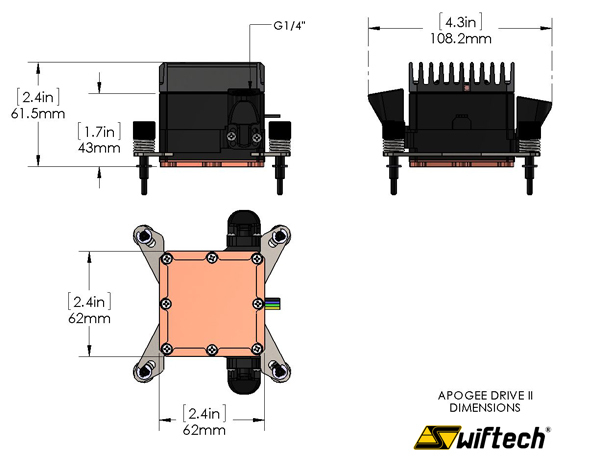 Here is the Apogee Drive II and everything that comes with it. 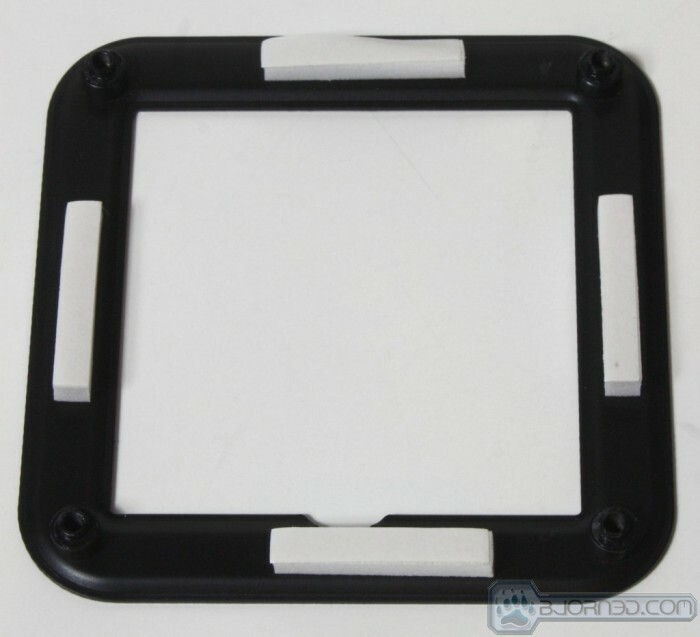 It comes with mounting for virtually any Intel socket currently available and also AMD kits upon request. Also included is one of new favorite TIM in the Swiftech Tim-Mate thermal paste. 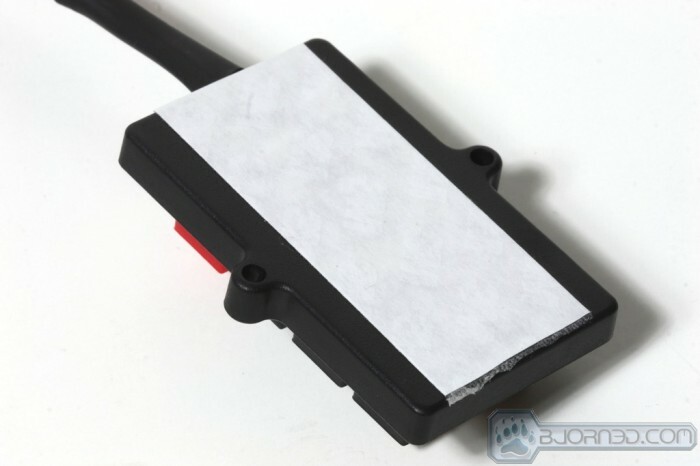 Also included are different color plastic fillers that go into the top heatsink of the waterblock so that when lit can light up any of the 3 colors you choose (red, green or blue) which once again speaks well to the attention to detail and Swiftech keeping a mindful eye on what the enthusiasts community wants to see. 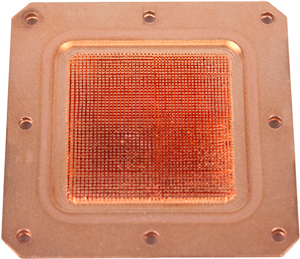 Here is the baseplate of the waterblock which is 62x62mm square and as you can see utilizes the ultra fine micro structure matrix which allows for good liquid flow while also maximum thermal transfer capabilities. 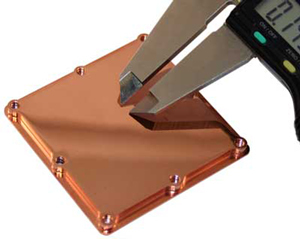 Also note that the mating surface is mirror polished and super flat to match up nicely with your CPU IHS. The water has to go somewhere to cool off and that’s where the radiator comes into play. This unit has a very capable radiator for our task of keeping our review motherboard/CPU cool. 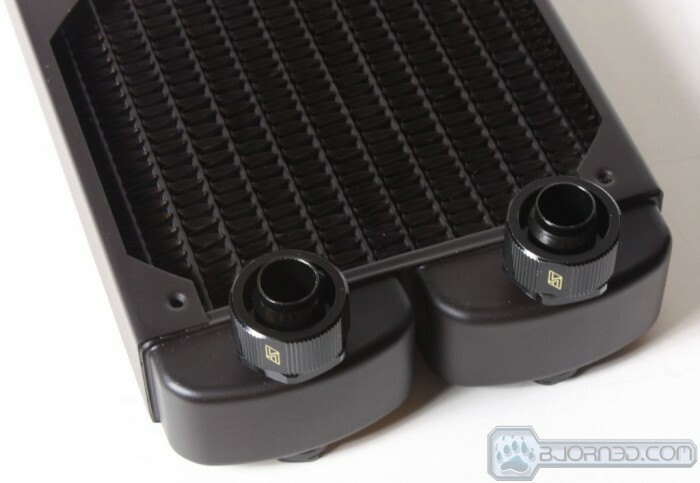 The unit used in the Elite kits is a high performance QP series which has a reservoir built in by way of a enlarged radiator end tank for a larger capacity and also a place for air to trap rather than in the lines. One major difference versus the previous Edge HD kit we had tested is that this radiator has the more standard in/out ports and lack of onboard pump which is nice and makes hose routing and mounting a bit easier. The Radiator comes pre fitted with the Lok-Seal Compression fittings in place but there are ports on both sides so that they can be located however is necessary for your cooling loop. Testing this cooling unit we will compare it to some of the top end air coolers we have for testing as well. This should provide a direct comparison to the performance you get for what you pay. The testing we will try to max load the CPU for an extended period to see how well it not only handles a load but ensure that the cooler does not heat soak or become overloaded during extended loading periods. Most of our previous testing was done at 4.8GHz on this chip so we decided to re-run the tests as many factors have likely changed and that could have a affect on the test and the performance result. We really hope other manufacturers will soon get us some kits to review as well so we can have a real shootout here since so far these are the only high end liquid coolers we have seen come through. We are more than happy to put any liquid cooler head to head with these units given we can get our hands on them. We do understand that Linpack programs provide maximum heat output for thermal testing but we do not go that route as we have seen far too many component failures due to overstress situations and therefore we choose a more appropriate load such as video encoding, multiple back to back Cinebench runs or just full threaded Wprime runs to simulate full system load without the excess that can cause damage. We run a full spectrum of different real world programs that users would normally run and even productivity apps that keep the CPU at full tilt for long periods of time to ensure the loop and all coolers get a full heat soak and the highest temperature possible. The reason the test is done over a long duration is to ensure that we test performance when the temperature stays high, and not just at aberrant spikes. 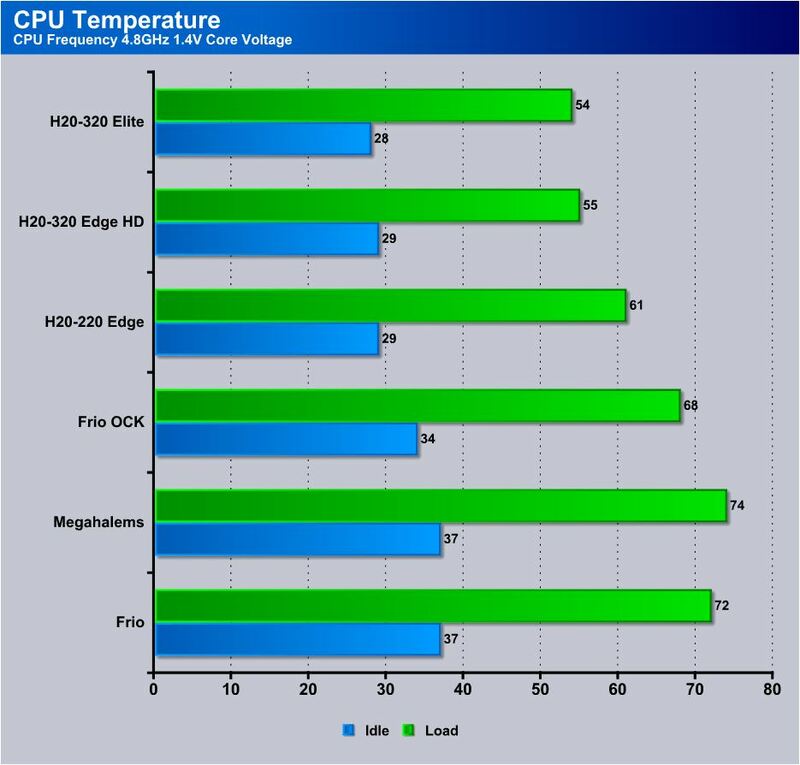 Here you can see that the performance is virtually the same minus possible minimal variations but this speaks well to the new Apogee Drive as it holds right there with the Apogee HD in the previous Edge HD kit we tested. It literally was side by side with it in comparison, and of course being a full custom loop you going to blow away even the best air coolers but then again this is at stock. Next we will put the fire to our chip and see how the coolers perform running full tilt at near 5GHz overclocks. 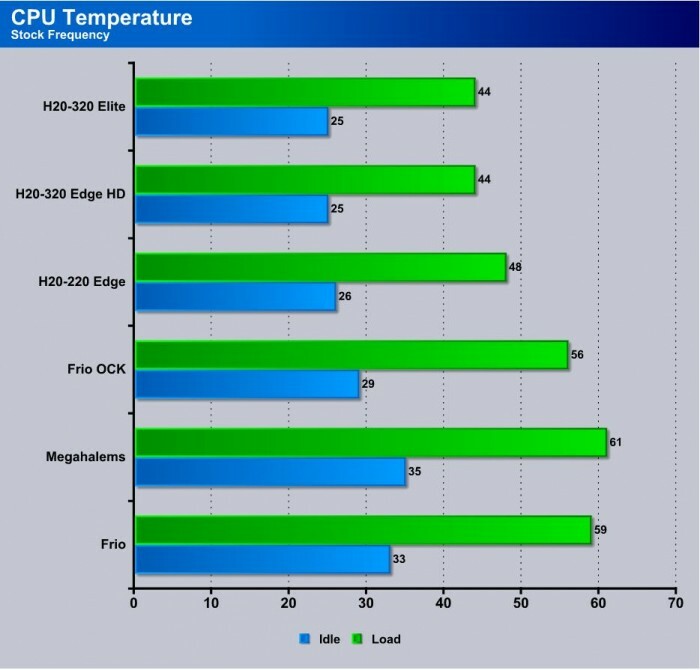 When overclocked the Elite kit once again is right next to the Edge HD although very slightly better with approximately 1 degree better at idle and load. Once again this shows major promise since the apogee HD is no joke and one awesome block so to be able to match it with a heat generating pump on its back thats no easy task. Needless to say the lead above air coolers grew with teh higher heat load especially during extended testing as the air coolers simply could not keep up. The Swiftech H20-320 Elite is one hell of a liquid cooling kit. 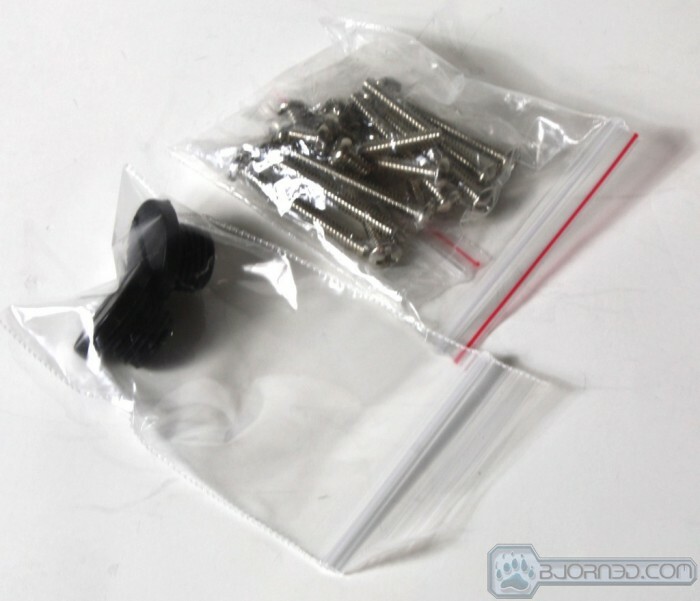 We do use the word kit loosely as many think of kits as a combination of cheap parts thrown together to give you something easy to use. 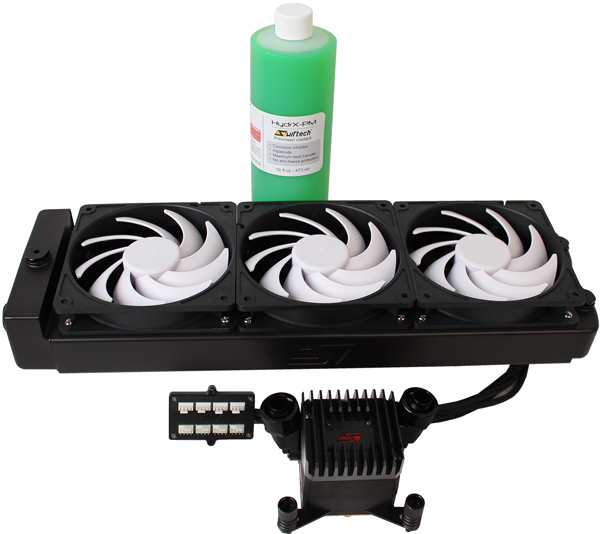 This is not one of those kits as it uses top quality parts all matched to make for a great performing and functioning cooling solution. There have been many advances and not one we can point out as being the best. They are all awesome from the Apogee Drive block, to the Lok-Seal fittings and even the PWM fans are all excellent additions to an already powerful offering. Add to this the major innovation in the way of the 8-Way PWM splitter and I’m sure you can see that there is some real possibility built into this one part alone. Just in the ability to match all fans on a radiator to the same PWM signal is a huge plus in my book. Moving the pump to the block from the radiator will go a long way in the convenience side of things as we have installed a few H20-X20 kits now and with the pump on the radiator it could be a little tough at times to maneuver in the chassis while mounting. Even more so when considering you also had to fit the tubes onto the pump. Anyone looking to get into the high end liquid cooling game without having to search for each component and just hope they match the H20-X20 series is sure to be a hit as its all there just waiting for you to snap it in and start the engine. There really is no other kit like it on the market we would say that offers this level of performance along with such an easy installation. Summary: The Swiftech H20-320 Elite offers a load of new features, excellent performance and overall easy installation. For this it earns the Bjorn3D Gold Bear Award. Well… IMHO, the only thing good about this kit is that it’s at least better than the plain H20-320, which was just a few degrees below H100 and cost $350. Let me see, $280? A Kyros HF: $85, Coolgate triple 120mm, all copper: $100, PMP-500: $75. $260. 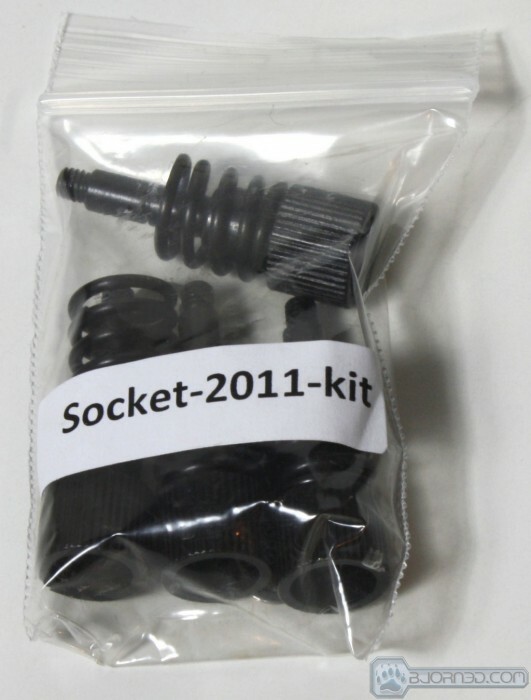 Get a few Bitspower compression fittings, a little tubing and some hachapichi cheapass reservoir from eBay LOL… and you have a setup about the same price as this kit, that completely blows it away in every way, shape or form. It’s for adjusting the RPM power of the pump via PWM, not really a fan controller. I’m sure something similar has been done before and lays on somewhere between hundreds of eBay items… though, yeah LOL. Going to be real hard to find something like that.